War makes facists of us all: Would you like to know more? 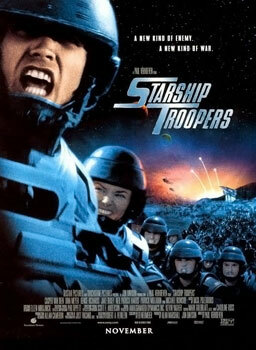 Over the years I’ve taken my lumps from friends for loving Starship Troopers. Most who haven’t seen it assume it is a dumb sci-fi action movie. But listen to the directors commentary and the first two things you’re told is that the movie is about “how war makes fascists of us all” and that the Federal Network “media sequences” are based on US World War II anti-Japanese propaganda films. Now that’s dark. How dark? Well, I’ve always felt that Starship Troopers was to the film medium what 1984 was to books. Yes both are sci-fi, but more importantly they are bleak looks into how technology and power can merge to create a nightmare future (indeed, on a wild tangent, 1984 may be one of the best arguments for why we need an open web). So if you’ve never thought of Starship Troopers that way (or any way!) I can’t say enough good things about Scott Tobias’ revisit and analysis of the movie 13 years later. It is brilliant. In fact, stop reading me, go read him. Not only a far better articulation than anything I’d have written but it also goes places I’d never gone: Tobias’ observation that Starship Troopers is an allegory for September 11th before it happened is brilliant. Yet the key to the Federal Network’s power isn’t necessarily the clips themselves—which feature such great cultural advancements as televised executions (after whiplash-swift justice) and barely censored “censored” violence—but the prompt at the end, “Would you like to know more?” That’s what makes it effective as propaganda: the illusion of knowledge, the illusion of choice, the illusion that people have control over their own destinies. Sometimes that feels exactly like what we get from CNN/MSNBC and especially FOX News… but then willingly or unwillingly, in the first decade of the 21st century war has already made fascists of us all. This entry was posted in commentary, reviews and tagged commentary, movies, reviews, technology on June 16, 2010 by David Eaves. Verhoeven is a genius, having fun, trying to be populist, and misunderstood as a consequence (less overtly didactic than Spike Lee – no post-film montage as in Bamboozled). For reasons of family history, when I saw ST with a Dutch friend when it first came out, we got it right away, in an almost empty cinema, with some bemused teens enjoying the action but not getting the seemingly oddly disjointed dialogue and acting. But my friend and I felt like we needed showers afterwards, to wash the filth off. Because we knew what Verhoeven had done, and how he had forced us, the audience, to collaborate whether wanted to or not. Verhoeven made a Nazi propaganda film for the modern day. And when you watch it, even if you know what's going on, and disapprove, simply by watching you are placed into a position of collaboration.In Europe, everyone got it right away. In North America, few did, or do. As with all Verhoeven's oeuvre: he's trying to make European themed meditations on essential questions in a blockbuster NOrth-American way, to reach everyone, but it's just seen as odd, often, as he respects himself and audience too much to wink at them, as compared to North American auteurs, Lee, Cronenberg, Lynch, etc.. They have a low opinion of their fellow citizens and assume everything has to be obvious, as did Mendes, in American Beauty. Verhoeven, from the most egalitarian and democratic tradition there is, treats people as he'd want to be treated. Unfortunately, North Americans aren't up to it, once again demonstrating importance of decent public education to democratic societies.My friend, now working for Dutch Foreign Office, also noted, shortly after 9/11, unconscious prescience of film as regards inhuman enemies in caves far away who apparently attacked us for no reason bit because they're evil and want to destroy us, and ignorance of any responsibility on our part for these state of affairs – as in ST, it only comes out in passing, at very end, from evil Doogie Mengele (Verhoeven cracks me up).Glad to know at least one other North American got it.